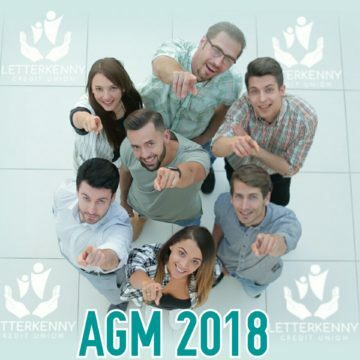 Notice of Annual General Meeting 2018 - Letterkenny Credit Union Ltd.
take place on Wednesday, 12th December 2018, at 8pm in the Mount Errigal Hotel, Letterkenny. We will have an AGM Draw for 50 prizes of €50 each for members attending the AGM. Refreshments and raffles will take place after the conclusion of the meeting. MEMBERS ARE REQUESTED TO BRING THEIR PASSBOOKS TO THE ANNUAL GENERAL MEETING AS A MEANS OF IDENTIFICATION.